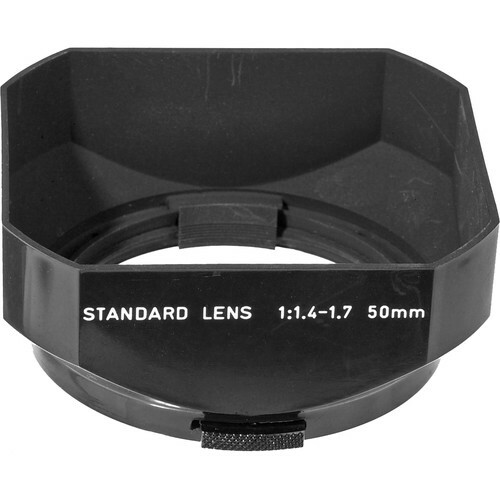 Box Dimensions (LxWxH) 6.1 x 3.4 x 2.1"
49mm Rectangular Lens Hood is rated 4.8 out of 5 by 6. Rated 5 out of 5 by P Thomas Lambert from Square is Perfect. This Pentax Square 49mm hood was purchased as a lens hood for a SONY 50mm 1.4 With the addition of a 49mm UV filter, this lens hood was a perfect fit. Also make the lens more impressive looking on the retro side. Rated 5 out of 5 by Pat from Does the job well. Spring loaded clip style mount means that it holds on well enough to not fall off by accident and is quickly interchangable, but if you were to smack it hard on something it will let go of the lens before either breaking the hood or the lens mount. Properly sized with a square shape for maximum coverage with my 50mm lenses on my old full frame 35mm film cameras. Really helpful for getting wide open sharpness from the 50mm lenses. Rated 5 out of 5 by CMvideo24 from Durable and works well I bought this lens hood to go with my camcorder and an adapter ring from 46mm to 49mm to fit the filter size on the camera, it works very well. It was a little snug on the adapter ring but I got it to fit and it works fine if you don't plan on taking it off the adapter ring but I think the adapter was a little big in the first place. Overall it works great and protects the lens as well. Rated 5 out of 5 by Timothy V. from Pentaxer 64 It's a very good product to me I've been a pentax user since I was in High School during the 1980's in fact I still have my pentax K-1000 camera which I'll NEVER PART WITH. Will this fit on any 49mm thread mount(filters, adapter rings, etc)? Yes this fit any 49mm thread however, dependent on the lens, some lenses will vignette due to the hood. They do appear to be made out of the identical mold. I would guess that the quality of plastic and the finishing would be better on the Pentax. The brand name is the only other difference besides price we can see. So if you wish to economize, go Vello. If you are OCD about Pentax, go that way.